Remote Control Codes for SAT and DTV Boxes. 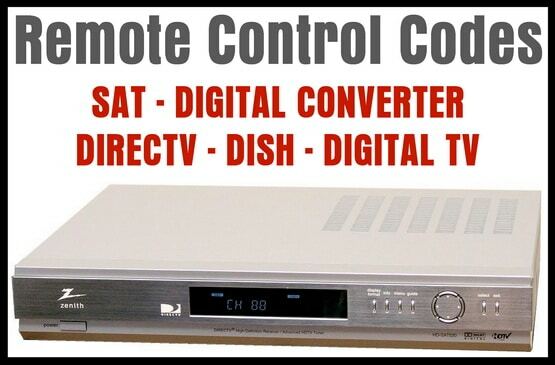 We have a full list of 4 digit remote codes that will help you to program your universal remote control to work with your SAT, DISH, DIRECTV, CONVERTER, HIGH DEFINITION TUNER, or DTV box. If we do not list the SAT or DTV box you need, please let us know in the comments below and we will add it to our SAT DTV Code List. These codes will work with an inexpensive GE Universal 4 in 1 Remote. A GE 3 in 1 Universal Remote Control will work also. How do I program my DIRECTV remote to my Vizio TV? How do I program my rc71 DIRECTV remote? How do you program a DIRECTV remote? How do I program my DIRECTV Genie remote to the receiver? Here is the DirecTV Remote Code Lookup page to find the codes for your DirecTV. Need a code or Brand not listed? Please leave a comment below and we will add it to our list. Codes and compatible remote for Akai KPVR-716T set top box/dvr, pls? Also use Sony EF41SN3 TV and JVC HR J666EA vcr. MUST be keypad entry or pre-recorded. No IR learning possible. I am trying to find the codes for my Mitsubishi remote control to my RCA digital converter box. I have upgraded to the hopper 3 from dish and it has the 52.0 remote. I bought a universal remote from GE I can’t use any codes for it. I am needing remote codes for an RCA Digital Converter Box RCA DTA800B1L. I have a GE universal remote, 33712. I also have a Ematic digital converter box, AT103B. I tried these codes…0028,0025,0029,0022=none of them work. I am looking for a code for a Grundig set top box, GSTB4100FV. Everywhere I look i only see Grundig TV codes. I have a Ikonvert sc-55 digital tv converter box i have it hooked up i lost the remote so i went and bought a GE universal remote I can’t get any codes to make the remote. Work for the box. Could you post the codes for the Digital Stream converter 9900 (15-500)? I have an One for All 4060 and am looking for the 3 digit code. We have searched and only found 5 digit codes for the Digital Stream converter 9900 box. Try using the 5 digit codes and removing the last 2 numbers to make a 3 digit code, sometimes this works. If not, you may want to either use the remote that came with your Digital Stream converter 9900, or buy a different remote that will accept 5 digit codes. I need codes for a Apex digital converter box – from a one for all universal remote URC 2060. APEX digital converter remote codes: 3025, 3026, 3027, 1236, 1240, and 1241.